As Battle of Britain Day on 15 September passes, marking another year further away from the iconic 1940 air battle, thePipeLine highlights concerns that the Port of Dover’s proposals for a major dredging project on the Goodwin Sands, could place the final resting place of missing RAF and Luftwaffe aircrew at risk. Seventy six years on from the titanic air battles of the summer and autumn of 1940, a new Battle of Britain is raging over the Dover Straits. However, this time the targets are not the ports, airfields, factories and homes of southern England, but the plans of Dover Harbour Board to dredge sand and gravel needed for the extension of Dover Western Docks, from the south west corner of the environmentally and historically sensitive Goodwin Sands, just four kilometers off the Kent coast. Archaeologists, historians and campaigners fear that this time the casualties and collateral damage caused by the dredging could include the last resting place of as many as seventy Battle of Britain aircrew from the Royal Air Force and the German Luftwaffe, not to mention an unknown number of other airmen and military personnel reported missing in action in the area during World Wars One and Two. Still more concerning to many, especially local campaigners in Dover and Deal, is that one of the missing airmen whose maritime military grave might be threatened by the Port of Dover’s dredgers, is Pilot Officer Keith Gillman of 32 Squadron, who was actually born in Dover on 16 December 1920. Pilot Officer Gillman was reported missing over the English Channel off Dover on 25 August 1940 when a mere eight aircraft from his squadron intercepted a German raid which included an estimated thirty six Me 109 fighters. After his death Keith Gillman, who was aged just nineteen, became an unnamed icon representing all the RAF pilots who flew in the battle. 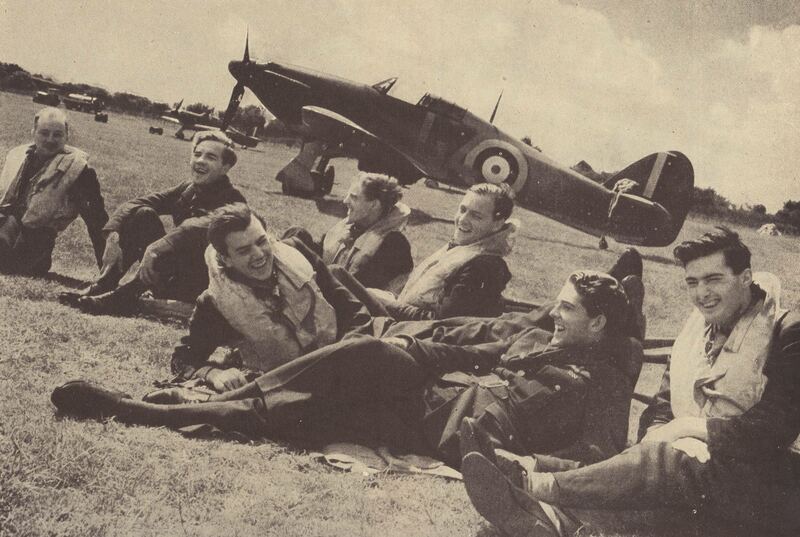 A week after Pilot Officer Gillman’s Hurricane fighter was lost the young pilot’s photograph appeared on the front cover of Picture Post magazine. This publication ensured that the nineteen year old Dover man became a pin-up boy for Churchill’s “Few”; the pilots of many nations who flew for the Royal Air Force and held the might of the Luftwaffe at bay in the Summer of 1940, and in so doing inflicted the first major defeat on Nazi Germany. Ultimately Keith Gillman received the posthumous accolade of appearing on the commemorative stamp issued to mark the 75th anniversary of the Battle of Britain in 2014. “The Ministry of Defence are a statutory consultee and as such have been included in the Marine Licence Application process since the beginning. Experts have surveyed the dredge areas and identified exclusion zones for known archaeological sites. Should in the unlikely event of anything currently unknown be discovered it will immediately trigger the recognised industry protocol of mapping, recording and establishing an exclusion zone. The process for managing this is openly set out within the Environment Statement and was further explained in detail at the open meeting held back in July. However, independent experts are not convinced that such a watching brief is adequate defence against accidental damage in such an archaeologically sensitive area. There are also concerns at the way the Port of Dover tried to present the issue of potentially disturbing the maritime graves of military personnel to local people at a public meeting held on 14 July 2016. In a the section of a Powerpoint presentation relating to the archaeological aspects of the Environmental Impact Assessment, which was credited to Victoria Cooper of the Port of Dover’s environmental consultant Royal Haskoning DHV, and which was shown at the 14 July meeting, the only organisation with a direct involvement with administering the remains of deceased service personnel which was listed as being consulted was the Commonwealth War Graves Commission [CWGC]. Experts point out that, while it does excellent work in commemorating British and Commonwealth war dead, the CWGC has no statutory or regulatory role in the recovery of such remains, so it is unclear why the organisation was listed as a consultee? The lead role in this regard is actually taken by the Ministry of Defence, Joint Casualty and Compassionate Center which was not mentioned in the list. Indeed, if discovered such a site would become immediately a ‘Protected Place’ under the Protection of Military Remains Act 1986, meaning that the dredging would have to halt immediately and an exclusion zone around the position of the wreck would have to be established. Such is the potential for sensitive sites of all types in the proposed dredge site that in a worst case scenario for the Port of Dover, the dredgers could be faced an inefficient slalom between exclusion zones, while always facing the risk of encountering further material requiring the imposition of yet another exclusion zone. In the longer term experts consulted by thePipeLine suggest that a series of exclusion zones creating fresh banks, channels and pedestals of sand in an area of sandbanks where the seabed is already highly mobile, could destabilise the area and threaten the survival of the very archaeology and maritime military graves, the exclusion zones are designed to protect. It was also pointed out that there is no detailed modelling of this type of scenario in the EIA submission. “We cannot believe that the Port of Dover can behave so shamefully in applying for a licence to dredge the potential grave of one of our most iconic war heroes, Pilot Officer Keith Gillman from Dover. Given these comments thePipeLine asked a company spokesperson why the Port of Dover listed the Commonwealth War Graves Commission which has no legal role in administering military remains as a consultee, but not the Joint Casualty and Compassionate Center which does? We also asked; how does the Port of Dover answer the suggestion that the company should operate the precautionary principle, and rather than risk disturbing the maritime military grave of P/O Gillman and other military personnel, by dredging on the Goodwin Sands, it should collect sand and gravel for the port extension from a less historically and environmentally sensitive site elsewhere? As suggested, thePipeLine then approached the Crown Estate to seek its view. However, up to the time of publication they were unable to furnish a formal response to our questions. That said, it is understood that the Crown Estate does not normally express a view in such matters, instead leaving the environmental and procedural checks and balances to be applied by the Marine Management Organisation via the Marine licencing process under the Marine and Coastal Access Act and other applicable legislation and policy guidance. We have also approached the Ministry of Defence, Joint Casualty and Compassionate Center and asked if the Port of Dover, the Port of Dover’s consultants Royal Haskoning DHK, Wessex Archaeology which we understand had a limited role interpreting Royal Haskoning’s geophysical dataset, or the Government’s statutory advisor on heritage issues Historic England, had approached them for advice regarding the issue of the possibility of finding military remains in the proposed dredging area? We will report any responses we receive.